Over on the Dwell bulletin board they're discussing modern outdoor barbecues, and the pickings are slim indeed. It's obvious that grill makers have a long way to go when it comes to innovative design. There is a diamond in the rough, though, and it's called the Eva Solo Grill. 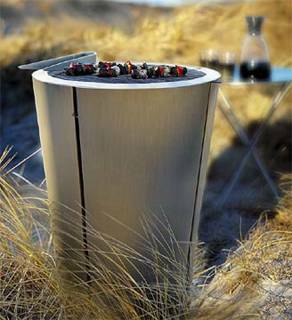 The Eva Solo is a gorgeous piece of stainless steel cooking art that doubles as a gorgeous mod-looking outdoor table thanks to a flat top design and a flat lid. When the grill isn't in use, you put the lid on top and you have a table. When the grill is in use, you use the included tripod legs to turn the lid into...a table. This grill is more than just the sum of its lid, though. It's also a grill that works the way most do: set some charcoal in it, then set the charcoal on fire and you're off and running. In the Eva Solo the charcoal sits in a removable bucket that makes clean up easier. You can also add an optional cooking dome and matching "tweezers" (i.e. tongs), plus a zip-up fabric cover. As usual good design will cost you, to the tune of $450 for the Eva Solo. The good news is that price seems to include free shipping at most online retailers. Pardon the pun, but that is a "hot" grill. Nice to see design somewhere in that over masculanized field of outdoor cooking. The post above was removed by Blogger by accident, not by yours truly. I'm trying to get it back.